Mr. Bruce Maza, executive director of the C.E. & S. Foundation in Louisville, Kentucky, led the organizational development consultation for the Giving Indiana Funds for Tomorrow program in Indiana that was funded by the Lilly Endowment. This statewide, multi-million dollar, decades-long effort ran parallel to the Michigan Community Foundations’ Youth Project (MCFYP) and had very similar goals. Facing comparable opportunities, challenges, criticism, and rewards as MCFYP, Mr. Maza worked very closely with the MCFYP project team to share ideas, create common tools, and provide consultation resources. He has remained an engaged observer of the development of the Michigan philanthropic community. Mr. Bruce Maza talks about his career in philanthropy. Mr. Bruce Maza talks about the importance of community foundations due to their lessons for future generations and their small scale focus. Mr. Bruce Maza talks about the tight-knit relationships he formed with the individuals developing the Michigan Community Foundations' Youth Project (MCFYP). Mr. Bruce Maza talks about how individuals in philanthropy should work to break down the power structure in society. Mr. Bruce Maza talks about the value of local leadership in community foundations. Mr. Bruce Maza talks about how some people were skeptical and opposed to the creation of numerous community foundations by the W.K. Kellogg Foundation and the Lilly Endowment. Mr. Bruce Maza talks about how the value of community foundations involves educating people about the philanthropic sector. Mr. Bruce Maza talks about his concerns for the future of the nonprofit sector. Mr. Maza earned his Bachelor of Arts in English and drama from Franklin and Marshall College in Lancaster, PA.
Mr. Maza relates his early introduction to philanthropy to his small hometown, where the “interconnectedness of all activity — business, government and voluntary sector — were in every way, everyday apparent.” The town had a philanthropic pulse evident in everything from the way they all worked together to put on the county fair to the way they all supported their neighbors. Growing up, Mr. Maza and his brother took part in their father’s gladiola breeding hobby by delivering the blooms to widows in town. It was this small action that had the most impact on Mr. Maza’s developing comprehension of philanthropy. Later, while studying acting in college, Mr. Maza began working for the New York City Opera Guild as a fundraiser. “I became instantly fascinated with why these ladies did this and how they generated behavior that produced the desire to give to the opera company,” said Mr. Maza. having at least one member who was comfortable having conversations with community members about endowed gifts. “I am certain that the most important characteristic of the successful young community foundation was when a sense of team pervaded the organizing group … each participating in adivision of labor that most accurately reflected the individual strengths and experience of each of the volunteers who had come forward to be the inaugural leaders of the organization. I knew that was going to be a success,” said Mr. Maza. Since the GIFT program’s beginning in 1990, the Lilly Endowment has helped the development and growth of community foundations in every one of Indiana’s 92 counties. Their combined assets have increased from $100 million in 1990 to approximately $2 billion today (1). Through Mr. Maza’s hard work and the GIFT initiative, Indiana community foundations have become a moving force in shaping their society and providing people with opportunities to engage in hands-on, local philanthropy. Mr. Maza currently serves as executive director for the C.E. & S. Foundation, which supports initiatives within the fields of higher education and international cooperation, and initiatives that seek to foster philanthropic spirit and nonprofit management expertise (2). Additionally, he serves on the board of the National Center for Family Philanthropy. 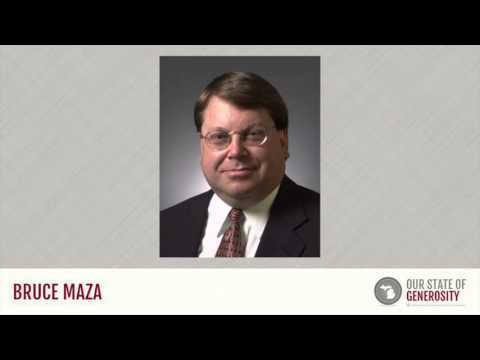 Mr. Maza was interviewed regarding his insights and experiences in working with Michigan’s philanthropic community and the Our State of Generosity (OSoG) partners. The following are selected quotations from his interview specifically related to the five organizing themes of the OSoG project.